Top rated Biertan tours do not include Fortified Church in their schedule, you can add it to your plan anyway. Use Biertan trip planner to visit Fortified Church and many others to your visit. Book perfect hotels in Biertan like Hotel Edelweiss, Transilvania Apartment, Fabini Apartments and Pension Unglerus. Curated Biertan vacation packages await! Book the best ones and start turning your dream into reality.Discover various ways for how to reach Biertan and complete the booking by choosing your mode of transport. Love this? Explore the entire list of places to visit in Biertan before you plan your trip. Fancy a good night's sleep after a tiring day? Check out where to stay in Biertan and book an accommodation of your choice. 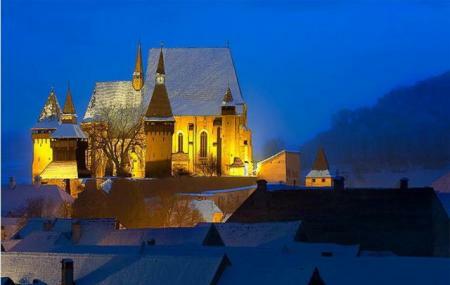 One of the most famous fortified Churches in Transilvania. A masterpiece very well preserved, away from the crowded cities, or main roads. High on the top of a hill, with two or three rows of walls, you feel that sense of security. The Church itself is simple as is the classic Reformed Church. Wonderful experience. Interesting site to visit. Incredibly popular with German tour groups. Shame you can't go up the towers but you can definitely feel the history here. Would be nice if more was done to restore it a little further. It was open in the first place. There 's a lot of fortified churches in the area , but the person who has the key of the church is at home or any other place. But this one is beautiful. A famous landmark of medieval and modern history. Nowadays, is in a poor state of preservation and to the subject and ignorance of authorities!